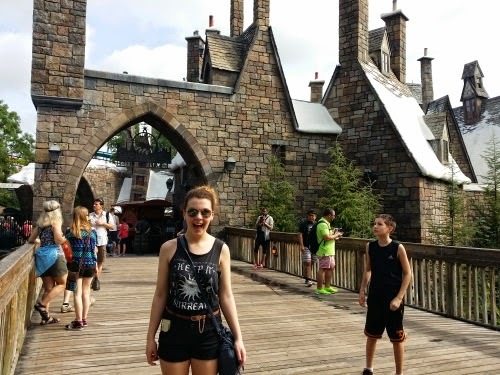 You actually don't need a spell to experience full joy when you are on a ride with your teenager in the Wizarding World of Harry Potter at Universal Studios Orlando. My oldest son was 10 (and looked a bit like Harry Potter) when the very first Harry Potter book was released in hardback. We picked up the book primarily because the boy on the cover looked like Matt and he ended up reading this book within a few days. We were hooked. He was so excited about this book series that he wanted to share it with his siblings. But it is a funny thing about this magical series. They are magical when you are ready for them. Our daughter wanted to read these books when she first started to read because her older brothers were pouring through them. But she wasn't ready. It wasn't that she couldn't read the words on the page it was just that she couldn't relate to Harry and his band of friends that were popping off the pages of these books. The movies were fantastic but even watching the movies didn't stop the kids from reading the books over and over again. Then came the video games and Scene-It the Harry Potter version. We were hooked. We went to midnight releases of the book releases and the movies. When Universal Orlando expanded their park to include the Wizarding World of Harry Potter we tried to figure out ways to get there. When you live on the west coast and and your troop of teenagers are involved with all kinds of activities at their school it can be a challenge to figure out a way or a time to get across country to make this happen. This spring the planets aligned and Cecilia and I were able to get to Universal Orlando for a visit to this long dreamed of destination. 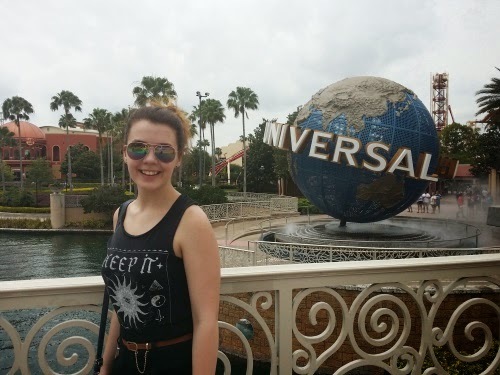 I had never been to Universal Orlando before and sort of didn't understand how it worked. We just wanted to go to the Wizarding World and I was a little bit confused how to buy tickets. I didn't want to go to Jurassic Park or the Water park there. We were on a mission to see Hogwarts. Universal Orlando is actually two different parks - The Island of Adventure where you will find Hogsmeade and Universal Studios Florida (future home to Diagon Alley) and so we got a parks pass for both parks. We drove into the Universal complex in the morning and drove through the maze to the parking garage. This was an easy process and put us a short walk to the parks. We headed directly to the first park where we would find Hogwarts. It was located on the far end of the park and so there was quite a bit of walking to get there but it took us through all the other amusement areas and so we were able to make plans for visiting other attractions after we had fully explored Harry Potter land. Then we saw it. The castle came into view and we knew we were close. It was fantastic. It was everything we had anticipated and hoped for. We went directly to get in line for the Hogwarts ride. We headed into the castle and from the very first step under the archway we knew there was something fantastic ahead. The line is long - no doubt. But the cool part of this ride is that even the line is part of the ride. You wind your way through the castle with holographic interactions from Harry, Ron, and Hermione. You see the moving pictures and get to see first hand many of the features of the castle that you have read about and have seen in the movies. It was fantastic. When we got to the part where the "ride" began it all was sort of blur. We sat down. We were stapped in. The staps were checked. And off we went. We were full on IN the Wizarding World on a broomstick and at one point smack dab in the middle of a Quidditch game following Harry Potter himself. In about 15 minutes we are going online and going to watch the red carpet webcast of the opening of Diagon Alley. We can't wait to get back there with the entire family. Diagon Alley looks like it is even wilder than Hogsmeade. The Wizarding World is tons of fun even if you haven't read any of the books or even if you haven't seen the movies - but it is out of this world fun if you are a Harry Potter geek. Getting a 2 park pass really worth it too. After we went through the Wizarding World we headed over to the Hollywood Studios side of Universal and we went through the rides there. Cecilia loved the Transformer ride so much we did that one twice. It was Fantastic! While we were there just to see the Wizarding World we had so much fun exploring both parks. Cecilia will tell you Get the Fast Pass! We had fast passes for both parks and it was totally worth it! Thanks to Universal Studios for providing the tickets to both parks as part of our media tour in Orlando. Our geekiness for the Wizarding World is all our own. And our new found fandom of the Transformer ride was a total surprise.